It’s been a while since Mark Driscoll’s stepping down from Mars Hill Seattle church was announced and the dissolving of its central organization. So perhaps now, after all the Twitter fire has died down, we might ponder the meaning of these events for what it means for church life in N America, specifically, the model of organization known as Multi-Site Video Venue. MSVV has become a popular model of organizing for mega churches that want to continue to expand. And yet I contend ( and have contended for years) this form of organizing is prone to two “sins” that work against presence and mission in a local community. I want to be careful NOT to over generalize because I know of multi-site churches who vigorously work to overcome these two sins. But to me, if you examine the culture of many multi-site-video venue churches, these are the two stunningly repeatable sins that occur regularly within them. If one elects to become part of/or a leader in a MSVV church I would urge that person to vigilant in discerning these two sins creeping into the organization of the church. Here’s the two sins as I see them. . SIN #1 – Multi-Site Video Venue (MSVV) is prone to decontextualization. When one franchises either a teacher or a church model based on one location and transfers it en toto to another location, one has in essence disregarded the local context, its culture and instead assumes that who we are and what we say as a church applies to you with no dialogue or presence needed. It asks people to come to me on our terms. We have what you need. It is a profound act of colonialism. The result is that this church most often will “attract” people of like ilk who already believe the same things and use the same language to gather in an homogenous group. This group cannot help getting enclosed and even defensive because it did not start with people in local context, it started with what it already knew and was comfortable with. When this happens, this church has become incapable of mission. It becomes a defensive enclave. This is why decintextualization is sin# 1 of video venue. SIN#2 – Multi-Site Video Venue (MSVV) is prone to hierarchical organization. It is after all built on the premise of centralized organization. It in essence makes decisions and funnels funds and other means of power from the center out. Even worse, many video venue churches, that pipe in the teaching of one powerful pastor personality, tend to hierarchilize this authority around one man (rarely a woman). The organization becomes centered and ordered towards the authority in this one man. Not only is such a system prone to enormous abuse, but this stunningly always works against mission. Because decisions are made by this one person, authority is extracted out of the local contexts and driven by the one vision and message of this one man. And yet this one person cannot possibly understand the local contextual issues in every one of the video venues. This is why preaching tends to devolve from proclamation over the issues and problems of people’s lives and systems (in their local context), to generic teaching about how to live a better Christian life. This kind of teaching always lends itself to building up existing Christians (not entirely a bad things) as opposed to challenging people and bringing hope in the midst of mission. But, even worse, extracting authority from the local centers into the hands of a central committee/pastor always stunts the development of authority and ministry from growing organically in the locales of its own people. Because of Sin#1, video venue multi-site churches will often fall into the abuse of empire building, land acquisition (as I described here). In an effort to expand the brand, they will over stretch, over spend, and become consumed with raising money. This, in my opinion, always goes bad. Because of Sin#2, video venue churches will sometimes fall into the abuse of hierarchical authoritarian abuse. As the whole system becomes built on the one personality and pressures build to manage problems efficiently and pump out ‘services’ product, the singular leaders will be tempted to abuse his power, make unilateral decisions, and stomp over people. This in my opinion always goes bad. It never results in Kingdom. These are the inevitable sins of which multi sit video venue churches are prone. To me, Mars Hill Seattle, and its former pastor Mark Driscoll, is a case study of what happens when multi site video venue churches fall into these sins. They got caught up in spreading the brand, protecting the brand, spreading the brand to places far from Seattle (Albuquerque NM). It took so much money so they were forced to raise money under dubious practices. Meanwhile the pastor got caught up in authoritarian leadership. He did not lead collegially but in patriarchal abuse. Driscoll consolidated power more and more to the point where he singularly ruled over a small group of elders chosen to agree with him. He became unaccountable to anyone. All the theological implications of this were patently ignored. This led to the huge downfall. The response? (Seen here and here) The leadership of Mars Hill basically unwound the two sins. They decentralized the organization of the churches and de-hierarchicalized its leadership (although not totally). I say ‘kudos’ to Mars Hill leadership (finally). This to me is the beginning of the reversing of the sins of multi-site video venue churches. There have also been attempts to reconcile, confess sins and deal with all the abuse and sin of this church. Some have yet to be satisfied here. 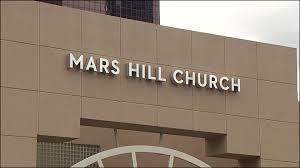 The case of Mars Hill however begs the question to all MSVV’s: Why wait until these sins take us over. They are endemic to the system. Why not consider the moves of Mars Hill post Mark Driscoll and implement them now before the sins manifest themselves in all their ugliness? Why not save everyone the grief? This to me is what all MSVV churches should consider. Every MMVV church should consider how can we contextualize our sites and decentralize de-hierarchilize our organization BEFORE WE TOO BECOME ANOTHER EXAMPLE OF MARS HILL SEATTLE. At the very least, every leadership team of a MSVV church should have in place the means to shape leadership in resistance to these two sins. What do you think? Is the diagnosis right? How has your MSVV avoided these two sins? 3 Characteristics of Missional Preaching: How the multi-site video venue works against mission. The Collateral Damage of Video-Venues: A Challenge To All Video Venue Multi-Site Church Leaders – DO A SURVEY!